Abbas spokesman says PA is preparing to deal with American and Israeli "threats". Nabil Abu Rudeineh, official spokesman of Palestinian Authority (PA) chairman Mahmoud Abbas, on Thursday stressed the PA’s steadfastness and adherence to its national basic principles, headed by eastern Al-Quds (the Arabic name for Jerusalem –ed. ), which he called "the capital of the state of Palestine." "The city of Al-Quds is full of history, tradition and religion, and it will be the answer to any challenge, and it is a crossroads in order to deal with the occupation, which is determined to continue the settlement and attacks in light of the American position which is biased against our people and its legitimate national rights," Abu Rudeineh charged, as quoted by the PA news agency Wafa. Hinting at the American “threat” to Palestinian interests, he continued, "There are attempts to reorganize the region at the expense of the peoples of the region. These developments present a fateful decision, especially when we are now dealing with a new model that is developing rapidly and contradicts everything the entire Arab nation fought for." 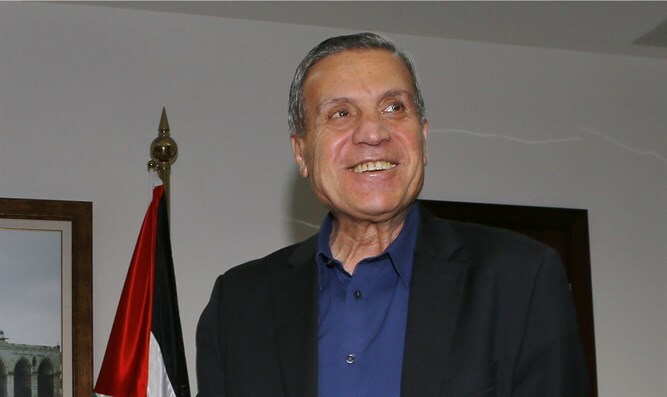 "The current developments, which undermine the foundations of the Palestinian national identity, impose a duty on the next meeting of the PLO Central Council which will deal with great challenges," said Abu Rudeineh. His comments come ahead of the PLO Central Council meeting which is scheduled for January 14. It is believed that representatives from Hamas and the Islamic Jihad will take part. Recent reports indicated the Central Council would consider declaring areas liberated by Israel in 1967 as "a state under occupation" at that meeting. The PA has been ramping up its efforts to achieve unilateral recognition of “Palestine” in the wake of U.S. President Donald Trump’s recognition of Jerusalem as Israel’s capital, which angered PA officials greatly. Abbas is now planning to bypass the U.S. and Israel altogether, by asking EU foreign ministers to recognize a Palestinian state on the pre-1967 territories with eastern Jerusalem as its capital.